LITTLE ITALY — The old bosses may have passed on, but the Mafia footprint remains. The Ravenite Social Club, formerly one of the most notorious Mafia hangouts in Little Italy, the headquarters for John Gotti and his crew in the 1970s and 1980s, is now a high-end footwear boutique called Shoe. Leila Mae Makdissi, the business's current owner, remembers the ethnic Italian character of an older downtown that she grew up in. 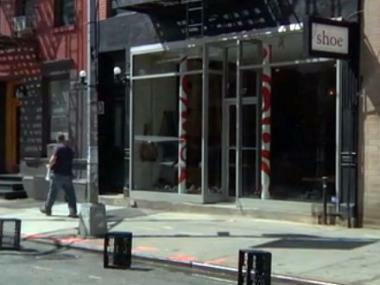 She said she witnessed the storefront's history firsthand. In an interview with Street Smart Video, Makdissi recalls Godfather John 'Dapper Don' Gotti and his friends parking their big cars on the street and taking walks around the block. "Supposedly, if anybody misbehaved there were the, you know, the goodfellows who would take care of things for you," she said. Located at 247 Mulberry Street, the Ravenite Social Club's old identity as mob hangout and New York family headquarters has nearly vanished beneath the Shoe's welcoming, warm-toned displays and high-end wares. Despite the shop's new place in the world of contemporary Soho couture, however, the ghost of Gotti still lingers. "People from all around the world come here all the time and ask us, "Is this the place?" Makdissi says. Shoe's renovators deliberately preserved the building's old tile floor - its cracks and grimy red rosettes suggest a less polished history - and Makdissi says that visitors still sometimes ask her if they can kiss the ground.